Staying in a nice log cabin at the Grand Mountain will give you an awesome staycation and it isn’t only offering a relaxing and wonderful stay but also an unforgettable experience. Most of the Branson Cabin accommodations at the Grand Mountain are fully decorated inside and out at any time of the year. The convenient location of Branson Cabin is only five-minute drive to shopping areas, live entertainment shows, restaurants, and exciting attractions. The popular 76 Country Music Boulevard is just a few minutes away from your cabin accommodation where you can enjoy world class live entertainment shows and other exciting attractions. Branson Cabin is one of the most widely patronized lodging venues in Branson because of its beautiful location in a secluded place near the hillsides of the Ozark mountains. This awesome cabin accommodation provides every guest a luxurious and comfortable living that can only be experienced at the Grand Mountain. Many guests who have experienced a wonderful vacation in a nice log cabin in Branson described the place as warm, homey, and inviting. Guests arriving at Thousand Hills Golf Resort are greeted by old-fashioned redwood rocker. Every cabin accommodation at Thousand Hills features a front or back porch where it’s great to spend a relaxing moment as you drink a cup of morning coffee. The roomy 1,150 square feet floor plan of each cabin at Thousand Hills allows you to feel a relaxing and convenient staycation. Each bedroom has great features of quality king beds with 100 percent cotton sateen, 400 thread count sheets, comfy pillows, and plush blankets. As guest of Thousand Hills, you can have the chance to play the popular 18-hole golf course right near your cabin accommodation. The convenient location near the golf course is one of the reasons why many guests prefer to have a relaxing staycation in a nice log cabin rather than stay in a regular hotel accommodation. All of the cabin accommodations at Thousand Hills feature ceiling fans, nice closets with double mirrored doors, lots of drawer space, and private bathrooms with hairdryers and clock radios. The master bedroom features a separate toilet with jetted tub, large rain shower, and other vanities. The living area features a sofa sleeper perfect for accommodating extra guest. Each cabin accommodation also has essential amenities such as flat screen TV with HBO, free wi-fi internet access, and DVD player. As the place is near the heart of Branson, don’t miss to visit the new Branson Landing where you can find hundreds of retail shops that offer a wide variety of shopping items from ladies’ and men’s accessories to jewelries, sports items and hard-to-find objects and collectibles. In Branson Landing, you also can have the chance to enjoy the spectacular fountain show of water, fire, music, and light show that dances to a variety of musical tunes. 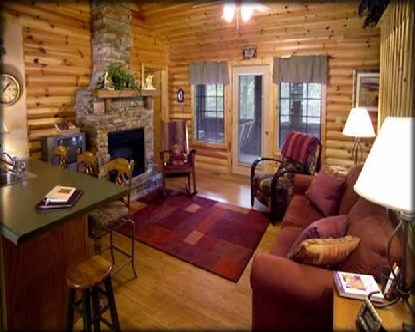 So, if you want to experience a wonderful vacation in Branson, stay in a nice log cabin at Thousand Hills Golf Resort where you can enjoy a relaxing and awesome staycation.